NewsHour Twitter Chat: Should Homelessness be a Crime? Join NewsHour every Thursday from 1-2 p.m. ET on Twitter to chat about current events. “Imagine a world where it is illegal to sit down. Could you survive if there were no place you were allowed to fall asleep, to store your belongings or to stand still?” These are the questions asked in a new report released last week by the National Law Center on Homelessness and Poverty on the criminalization of homelessness in U.S. cities. Over the weekend, PBS NewsHour reported on the Law Center’s findings, which were based on an analysis of laws in 187 U.S. cities from 2009 to present. We want to hear from you. Are laws against loitering, sitting and sleeping in public ethical? What can U.S. cities do to end chronic homelessness? Share your thoughts in a Twitter chat hosted by @NewsHour from 1-2 p.m. EDT Thursday, July 24th. We will be joined by the National Law Center on Homeless and Poverty (@NLCHPhomeless) and the National Coalition for the Homeless (@Ntl_Homeless). 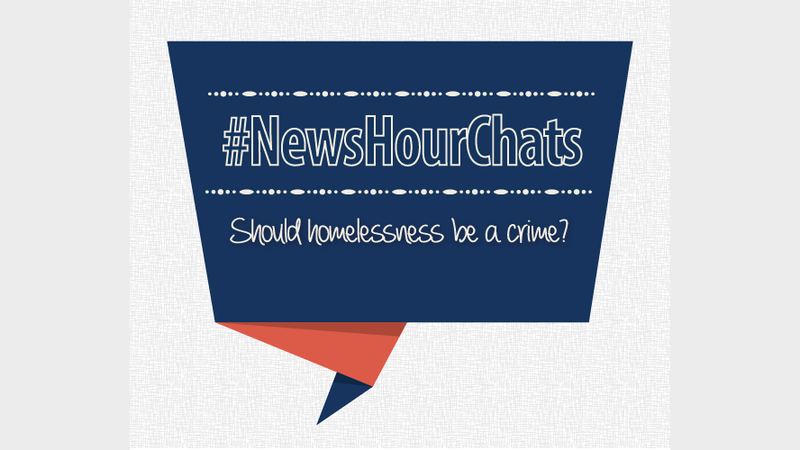 Follow along and respond using #NewsHourChats. This post originally appeared on PBS NewsHour's Rundown blog.